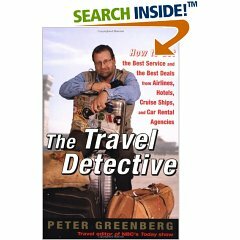 When I was first interested in a career in travel, I looked at Peter Greenberg as the “God of all Things that are Travel.” Now after years of admiring him from afar, my hero is in San Francisco doing a book signing. He will be signing copies of his new book, “The Travel Detective: How to Get the Best Service and the Best Deals from Airlines, Hotels, Cruise Ships, and Car Rental Agencies” at Book Passage at the Ferry Building on the Embarcadero. I plan on being there, and it would be great if you could come down and show Peter some Diva love.